Simple And Natural. Visual Appeal And Soothing Sounds Join Forces To Set The Mood. Stuff Points: Earn 85 points when you buy this stuff. Realistic looking bamboo shuts are positioned at different angles to create a whimsical path for water to flow. A powerful pump will bring water up to the top of the tallest piece, and once there it will spill out an opening on the side to fill the much wider piece next to it. That part will fill to the brim before water starts streaming out the opening to cascade into the slide piece beneath it. This opened piece of bamboo is angled downward to direct water into the large bowl at the bottom. The bowl will fill with water, and the bamboo formation will appear to float on top as it rests on a piece of natural stone. The hollow bamboo pieces enhance the sound of running water, and the visual appeal will improve any space. 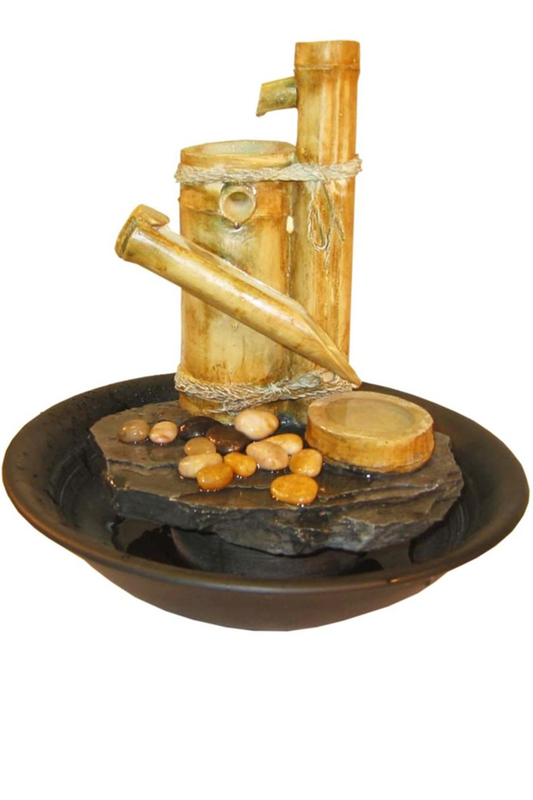 Set a tranquil mood in any location with this natural looking water feature. It looks like it came straight from nature, but it's actually made from a durable resin that gives it a natural look, but in a cheaper, less messy, and longer lasting package. It comes complete with every piece you need for operation, and the whole thing is backed up by a one year warranty from the manufacturer. Simple Set-Up. Includes all parts, and comes mostly assembled with easy to follow instructions. Realistic Look. Fiberglass resin construction looks like real bamboo but it's way more durable. High Quality. Better details give it an authentic looks, and top quality electronics ensure proper function and long lasting performance. Versatile. It's probably not tall enough to use on the ground, but the material is durable, so place on any table, inside or out. This model is 14 inches tall, and 14 inches wide on it's longest side. Intended for table top use, it's designed for placement on any flat surface, indoors or out. Natural looking bamboo shuts enhance water noises, and create serene visual appeal. Running water sets the mood anywhere you place it. Order Yours Today! Eternity Series Indoor Water Feature From Alpine. Replacement Misting Device for your Mist Fountain. Use Inside Or Out. Set The Mood With Relaxing Water Sounds And Ambient LED Lighting. Powerful 10 Watt bulb. Add intense white light, or choose from yellow, red, blue or green.